Lines are clear and simple, shapes are pure, geometric and distinct: a graphic strength so dear to the stylistic grammar of the House. The silhouettes vibrate under the sun, with optical lines that are almost kinetic. 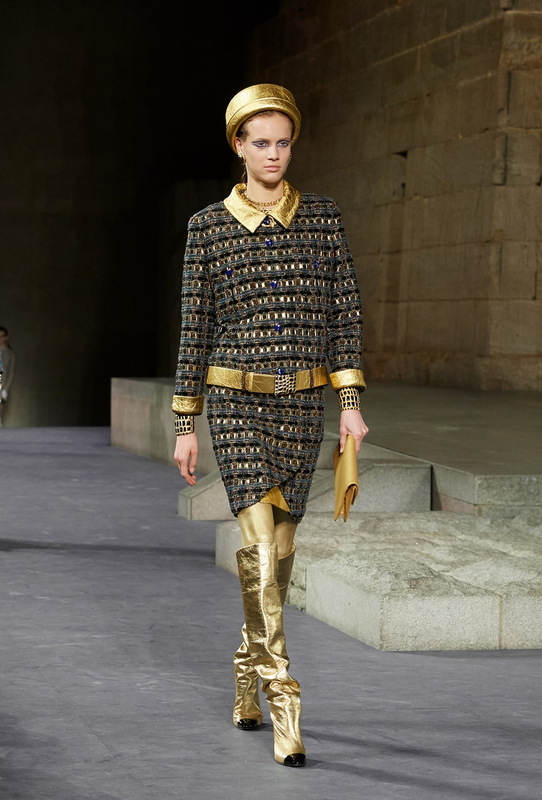 Karl Lagerfeld chose the Temple of Dendur at the Metropolitan Museum of Art in New York, to present the CHANEL Métiers d’art 2018/19 Paris – New York collection. Inspired by the spirit of the space and the exceptional savoir-faire of CHANEL’s fashion Maisons d’art, the designer delivered a genius, subtle and modern interpretation of the allure of CHANEL, rendering Egypt a timeless palimpsest. “Egyptian civilisation has always fascinated me: I get inspired by an idea, which I make a reality,” explains Karl Lagerfeld. Lines are clear and simple, shapes are pure, geometric and distinct: a graphic strength so dear to the stylistic grammar of the House. The silhouettes vibrate under the sun, with optical lines that are almost kinetic. The look is slender, lively and ultra-feminine, the hips emphasised by a wide belt, the shoulders highlighted with a plastron collar. Day dresses, suits and coats are worn knee-length, with a hemline that’s slightly shorter at the front, occasionally adopting the allure of a wraparound skirt. Gold, so cherished by Gabrielle Chanel, is everywhere, with so many variations it becomes a colour in its own right. Gold aged and burnished by time, gold dazzling with sunlight, sparkling gold, shimmering gold, crackled gold, flamboyant almost disco gold, gold tinged with bronze… Responding to the brilliance of this gold the wefts of the tweeds in beiges, whites and blacks reveal subtle and deep colours, turquoise or lapis lazuli blue, coral orange or ochre yellow, dark purple or coralline red. The braids are incredibly delicate, woven from mohair, gold thread and beaded cotton thread, embroidered with tiny stone squares in coral or gold, or with mini pyramids of turquoise, jade green and copper tubes, laid in relief. The hats, by the Maison Michel, accentuate the purity of the silhouette: ultra-modern boaters with a folded back brim that come in crackled gold leather. 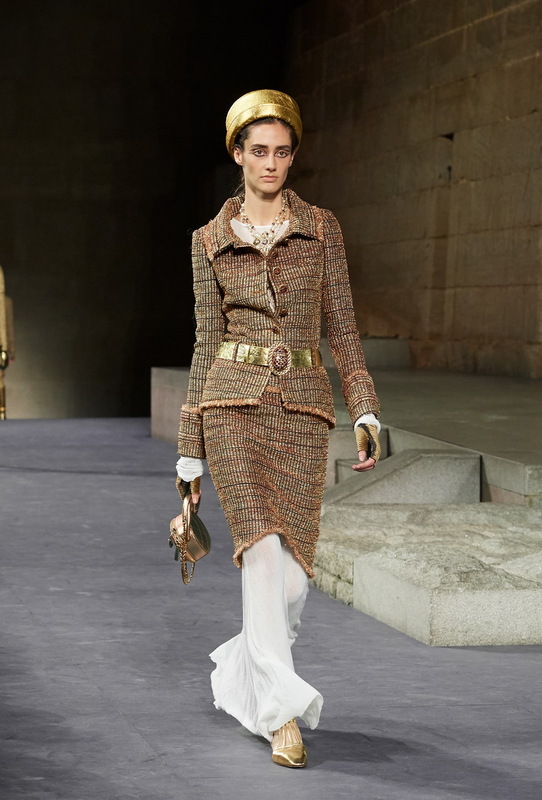 The complicity between Karl Lagerfeld and the CHANEL Métiers d’art takes shape as a perpetual creative dialogue, which illustrates the sumptuous elegance of the silhouettes and accessories in the collection. A resin plastron, asymmetric glass casts and golden leaves create an optical game of colours, just like Plexiglas, and a transcending reference to the skin of a crocodile. A shower of sequins seems to have been blown by the wind over a white dress, an embroidery featuring lotus flowers skims the hem of a skirt like a bas-relief: once again the embroidery ateliers at the Houses of Montex and Lesage demonstrate their art. The House of Lemarié depicts a graphic reinterpretation of Egyptian paintings, with delicate yet spectacular feather marquetry combining deep red, black and lapis lazuli blue, and appliqués on a plastron collar of miniscule flowers in denim and gold leather, cut with a raw edge and highlighted with beads. 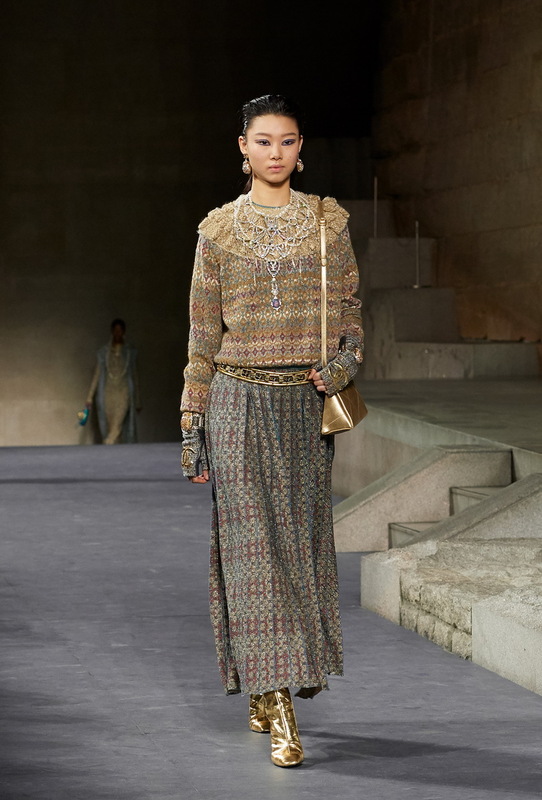 Knitwear is sophisticated: dresses and long cardigans in faded gold, bronze, turquoise and dusky blue jacquard… The buttons made by the House of Desrues, in sparkling and patinated gold metal or enamelled, are embellished with coloured cabochons or very 80s-style strips of strass. Leather is also part of this obvious modernity: it punctuates the pockets and collars of jackets, accentuates the rounding of a hem or plays with the stripes on the sleeve of a dress. The subject of new creative innovations, it toys with appearances: worked in relief, crackled or printed, it takes on the guise of crocodile, iguana and python. Just like the iconic bags: the 2.55 is graffitied with camellias and double Cs, the 11.12 is adorned with gold or sequins. As for the clutches, they come as graphic minaudières or mini pyramids. Each silhouette abounds with subtle details, gracefully sublimated by the Ready-to-Wear ateliers in the rue Cambon. Thus, the pockets of a jacket are concealed beneath a drape, the sleeves of evening dresses open out like butterflies, sketching the triangle of a pyramid in gold thread, or are pleated by the House of Lognon from black and gold strips, echoing the draping over the hips. Skin-tight, long sleeved dresses in fine white jersey accompany mini dresses and straight or belted jackets like a transparent breeze. Embroideries draw attention to the décolleté, the curve of a hip and the hem of a dress, like sumptuous jewellery, sculpting the silhouette. 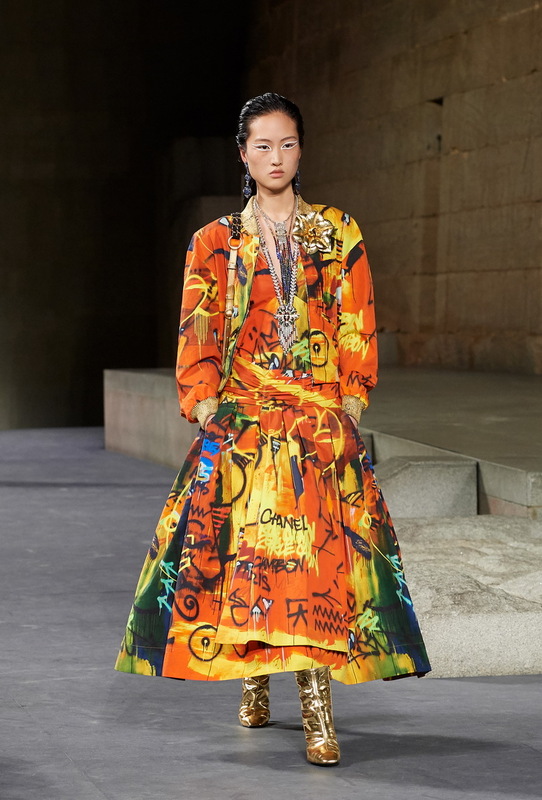 The graffiti artist Cyril Kongo, who created the invitations for the show as well as the cover of the press kit, also designed prints for a jacket, dresses and bags, the graffiti transforming cotton fabric into a precious material. “New York, it’s an energy and a melting pot of cultures, it’s very stimulating,” says Karl Lagerfeld, multiplying the tributes to the streets of New York: a denim aviator jacket with patches topstitched in gold thread is coupled with a street art printed leather dress; a pair of red or orange leather trousers, that appear lightly graffitied with an aerosol, are worn with a pop coloured XL cashmere sweater and a canvas shopper tagged with spray paint. 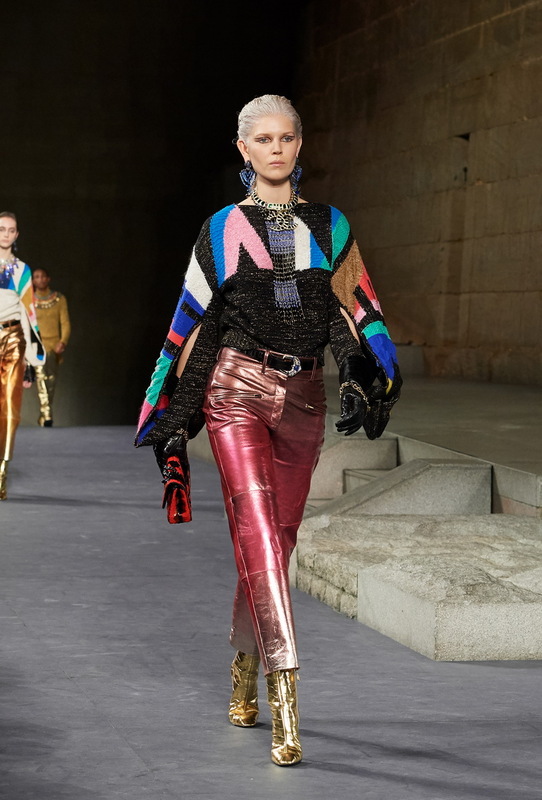 Thigh boots made by the House of Massaro are printed with gold or neon pink graffiti, and their gold jewelled heels highlighted with enamel and enhanced with cabochons. From street art to Art Deco and Antiquity, the jewellery multiplies and mixes the references, just as Gabrielle Chanel did in her time: gold net camellias, gold cuff bracelets and twisted leather bangles, necklaces of hammered medallions and in openwork with the letters of CHANEL, flat rhinestoned chains that combine the colours of urban frescoes with the graphic lines of skyscrapers… Like a benevolent sign, a piece of CHANEL Art Deco jewellery, dating from the 1920s and featuring the New York skyline is reinterpreted as embroidery over a plastron, the sleeves and the hem of a dress. Karl Lagerfeld’s ultimate reference to ancient Egyptian civilisation is the scarab beetle. Made by the House of Goossens using a mould originally created by its founder Robert Goossens – Gabrielle Chanel’s great accomplice – it punctuates numerous silhouettes: it comes as a necklace, buttons, belt buckle, earrings and minaudières. The scarab beetle, a cyclic symbol of the sun that is reborn every day, unifying the past, present and the future: a dream time, according to Karl Lagerfeld, in the scintillating shadow of a city that never sleeps. The ambassadors Soo Joo Park and Pharrell Williams both walked for the presentation of the CHANEL Métiers d’art 2018/19 collection at The Metropolitan Museum of Art in New York. Numerous celebrities were also present: among them the ambassadors Penélope Cruz, Margot Robbie, Lily-Rose Depp, Rinko Kikuchi, Liu Wen and Caroline de Maigret, as well as the actresses Julianne Moore, Blake Lively and Marion Cotillard and director Sofia Coppola, who all continued into the night at a party held at the Rumsey Playfield in Central Park.